Smith was taken at pick no. 8 while Magbegor was selected at no. 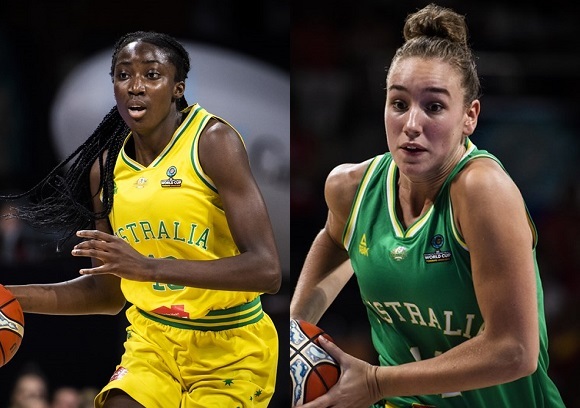 12 with the 2019 WNBA season set to tip off on May 25 Australian time. Coming off an incredible four-year college career at Stanford University which she capped off with a Pac-12 Scholar-Athlete of the Year award this year, Smith looks to be ready-made for the WNBA. She will play under Opals coach Sandy Brondello at the Mercury and alongside fellow Opal Steph Talbot as they aim to improve on their Semi-Finals finish last season. Smith was selected to the Opals team for the 2017 FIBA Asia Cup when she was only 20 years old, becoming the first college player to represent the Australian senior women's team. She averaged 10.8 points and 5.3 rebounds per game, helping the Opals to a silver medal while also qualifying for the 2018 FIBA World Cup where the forward again impressed, recording 6.3 points and 2.3 rebounds in 15 minutes per contest. Emerging as a star when she led the Australian Sapphires to a gold medal at the Under-17 World Championships while being named tournament MVP, Magbegor has already carved out a strong career internationally and in the WNBL. A whirlwind 2018 saw her claim a gold medal at the Commonwealth Games, a silver at the FIBA World Cup and be named the Betty Watson Rookie of the Year in the WNBL. The centre claimed 41 votes out of a possible 42, averaging 6.6 points on 52% shooting, 3.8 rebounds and 1.2 blocks per game which was good enough for eighth in the league. Last season, Magbegor bumped those numbers up to in a starting role for the Boomers with 8.7 points and 4.3 rebounds while shooting an equal-league best 56% from the field. She joins the reigning Champions in Seattle who swept their way through the finals last year with a 3-0 series win over Washington. Magbegor will now head to the Gold Coast for the first Opals camp of 2019. That camp is the first step of a significant year for the national team as they prepare for the 2019 FIBA Asia Cup and the start of the FIBA qualifiers for the 2020 Olympics and 2022 FIBA World Cup.